Although there’s still a few months to go before we speculate a Samsung Galaxy Note 4 launch, specifications of the very device have been cropping up from here, there and everywhere. This time round, the AnTuTu Benchmark database is the culprit. As we know, Samsung likes to launch Qualcomm and Exynos powered variants for most of its popular devices, depending on region of launch and radio. 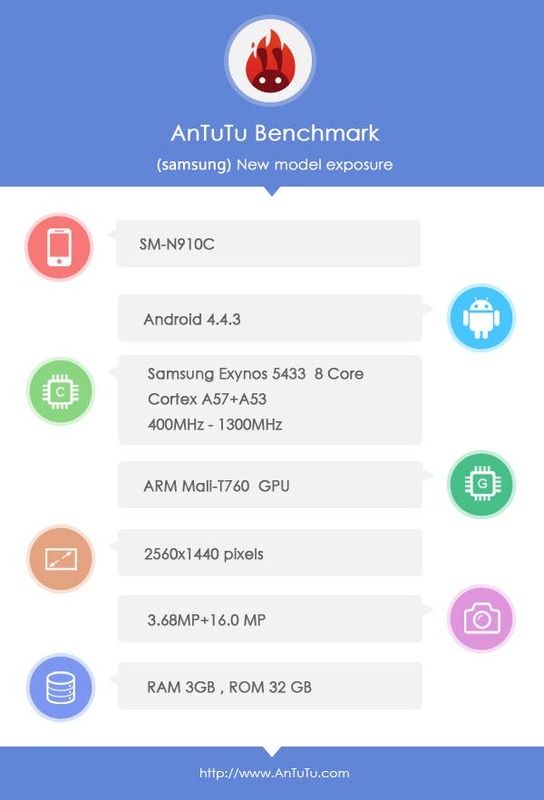 What we have here is what appears to be the specs sheet of the Exynos powered version. According to AnTuTu, the Galaxy 4 will rock an Exynos 5433 chip with 8 cores, using the Cortex A57 + Cortex A53 model. It also suggests that there’ll be the same 3GB RAM, 32GB ROM as the older (current) Note spearhead, along with a 16 mega-pixel rear camera and a 3.68 mega-pixel front shooter. Of course, there’s a chance that the specs mentioned in the listing might not be accurate (could be a prototype or an impostor), so we suggest you take this bit with a grain of salt. With a 2560 x 1440 QHD display, the Note 4 is all set to join the likes of the LG G3, OPPO Find 7 and the Vivo Xplay 3S in the 2K club. We’re expecting to see the Note 4 being launched at the IFA which is due in the latter half of this year.